Think Thursday: Why Not You?! 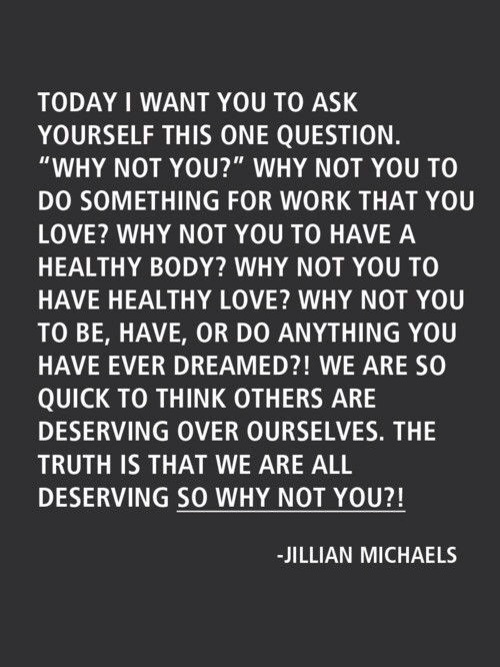 I read this quote by Jillian Michaels and thought: Yeh…why not me!? I couldn’t agree with this more. We are so quick to criticize ourselves over any and everything, instead we should be our own cheerleader/supporter. We often think that we are not deserving of all things that are good but we are. We easily doubt ourselves but we should know that we can do anything we set our minds (and hearts) to. We expect the worst outcome in situations but we have the power to change our mindset to think otherwise. Don’t let your blessings pass you by. Don’t pass off any more opportunities thinking you’re not ready because you are. Don’t block what God wants for you because it’s meant for you! Go after what your heart desires. Follow your dreams! Ask yourself “Why not me?!”. « Jamie Chung At Origins Global Launch!